I try to make it a practice to complete games before I write about them, but in the case of Bit.Trip Beat, I will have to make an exception. This game is so damn hard, I am unable to hazard a reliable guess as to when I will finish it. According to the game's official site, Gaijin, the developers, "wanted to make a game that used the tools of today to inspire the fun of yesterday." 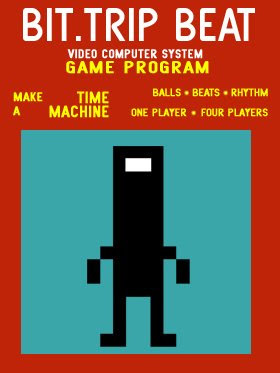 The result is a game that resembles a combination of pong, guitar hero and space invaders, all presented in glorious 8-bit graphics and sound. The retro homage goes deeper than the chunky graphics and chiptune music: this game channels the controller-throwing frustration that was 8-bit gaming. Gameplay takes place on a pong-style board, except the right paddle has been replaced by an off-screen block launcher that challenges the player to return a variety of shot styles. If the player is skilled (or lucky) enough to survive for any length of time, they are rewarded by being able to add to the music with each successful volley. The game starts with basic shots that send the ball towards the player in a straight line. Things soon take a turn for the vicious: although the projectiles' colors denote their behavior, trying to return a sinusoidal wave of pong balls while eyeing another group ricocheting off the ceiling is the stuff of nightmares. Bit.Trip Beat recalls a time when games were designed to grow fat off a bounty of quarters. The varieties of pong balls and their patterns are extremely difficult to volley, even after committing the patterns to memory. Memorizing patterns is one thing, but it takes calm nerves and a steady hand to clear the levels. The game seeks to challenge the player in different, equally maddening ways regardless of their success. Missing too many shots in a row will eventually plunge the game in to a black and white pong replica screen. In this mode, the only noise comes from the speaker in the Wii remote. Its harsh beeping reminds the player that they are perilously close to seeing the all too familiar "game over" screen. While the pong screen removes the distracting background graphics, it also strips the projectiles of their color, a crucial clue in anticipating their behavior. If one manages to put together a respectable combo of flawless returns, the game rockets into "hyper" mode: the music gets pumped up while the background graphics grow increasingly psychedelic. While these flashy rewards denote success, they often serve to make it even more difficult to see the balls which often lead the player back down into the pong-themed basement. Back at the game's website, Gaijin goes on to say "Our goal was to make a game that was as simple in gameplay as the games of the early 80s and equally as fun—even though gamers' tastes have changed over the years." They have done a good job tapping into the current popularity of rhythm games, as it is supremely satisfying to add to the well-done music. Mercifully, the game supports co-op, allowing up to four people to battle shoulder-to-shoulder in the pixelated trenches. This is probably the only reason I was able to clear the second stage. Still, "fun" is an odd word to use to describe this game in light of the medium's contemporary conception of challenge. The rise of the narrative-driven game has lead to a relaxing of difficulty in huge hits like Prince of Persia and Bioshock. Other rhythm games like Rock Band have generous "easy" or "no fail" modes. PixelJunk Eden was even patched to ratchet down the difficulty. Using these metrics, how can this game be fun? The answer is rooted partly in history and partly in the nature of the medium. Bit.Trip Beat reminds players of a bygone era in which brutally hard games ruled the main stream scene, unapologetically handing us our asses. The undercurrent of such an era is felt in most games, but raw challenge has been superseded by new design philosophies. Still, the occasional walk down memory lane is enjoyable, especially when the knowledge that a return to modern gaming is only a few menu clicks away. Additionally, Bit.Trip Beat remains attractive because it simply and elegantly illustrates how video games distinguish themselves from other mediums: while games might challenge our interpretive and analytical minds, they also provide a test of physicality, dexterity, and the implementation of theory. Bit.Trip Beat challenges us on a basic level: no amount of philosophy will make that paddle move any faster. It is a challenge to prove that flesh and bone can best silicon and pixels. And that is why I can't rest until I get to the third level.